Lobsters and rock lobsters are caught in salt water whereas those caught in fresh water are crayfish. We have been lucky to be able to have rock lobsters a couple of times this holiday. Rock lobsters, unlike lobsters, have no claws. But they are just as tasty. In the coast of Cervantes, rock lobsters are plentiful and regulations are strict to ensure a sustainable consumption of this delicacy. 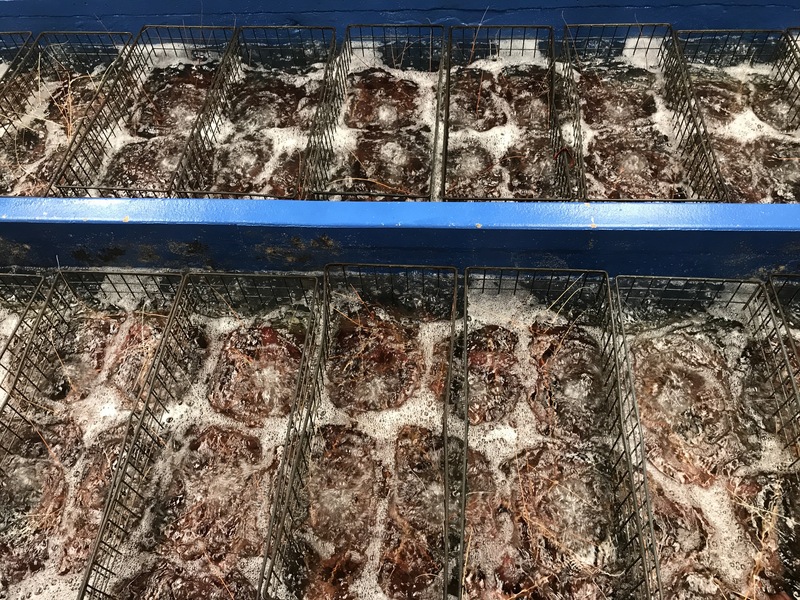 We walk through the factory and learn that rock lobsters can be put into a sedated state when they are in 5 degree waters. They can survive up to 30 hours in that state and keep the great price people pay to choose their meal live from a tank. They must, however, have no more than 3 legs missing. Lobsters quality is in the weight and are classed from A (the smallest size, though there is a minimum size for them to be caught) to H which can be up to 2.5kg. You would think that countries would fight for the big H sized lobsters but it is not the case. Places like Japan prefer the A and B grade crustaceans whereas places like Dubai like the size. In any case, any size is tasty so long as it is sustainably fished.